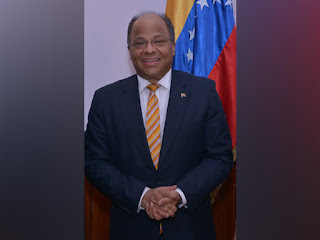 New Delhi [India], July 10 : Venezuelan ambassador to India, Augusto Vladimir Montiel Medina, created moments of panic at the Indira Gandhi International Airport when he lost his bag containing confidential documents. The bag was later recovered from another passenger after checking the CCTV footage of the airport. It was found that the bag was mistakenly handed over to another passenger by the airline staff. Sources said that the Venezuelan ambassador had left his bag containing confidential papers at "G" Row, Counter Number 2 of the airport. After scanning the CCTV, the staff was zeroed in and the bag was retrieved from the passenger and handed over to the envoy. According to an official at the IGI aiport the incident took place on June 26. The officials added that the ambassador who was scheduled to travel to Kathmandu via an Air India flight deboarded himself from the flight after realizing that the bag was missing. "A passenger named, Augusto Vladimir Montiel Medina along with a lady passenger came at the lost property section and complained about the missing of his confidential official documents. On inquiry it was learned that passengers offloaded themselves from Air India flight bound to Kathmandu on learning that the documents were missing," said the Delhi airport security official.